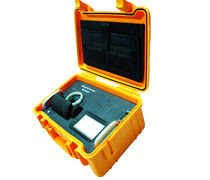 Portable Mid-infrared spectrometer-MIR3043P is specially designed for jade identification of A or B grade. According to the International GB T-16553-2003-Jewelry Identification, the unnatural B grade jade which is filled in manual material has strong absorption peaks between 2800 cm-1 and 3200 cm-1. And on this principle, MIR3043P can identify the grades of the jades. MIR3043P is equipped with high-efficient infrared light source, high-sensitive pyroelectric infrared sensor, digital demodulation technology, and the most advanced micro electromechanical wavelength scanning technology. It is anti-jamming and anti-vibration without any mechanical parts. It is easy to maintain and has a strong environmental suitability. 4.Equipped with moisture-proof optical originals, it can be applied in various severe environments. 6.Optimized mechanical structure, providing better chamber for placing jade pendants or bracelets. 8.Built-in Li battery, providing 4 hours of continuous working time. It can also be supplied with 12V car battery.